Photograph This! : On the road again. sport event. I went for a "hard lights" look,that is often used on the cover of cycling magazines. I asked my trusted friends David and Judd for help. 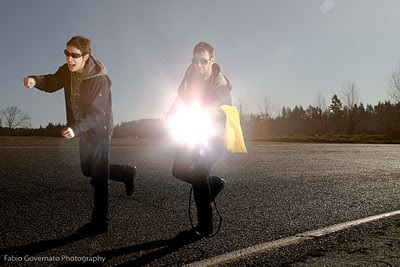 We took to the road an Elinchrom Ranger pack with a Ranger head and two Alien Bees B800 and set up camp on a straight stretch of warm asphalt. To overcome the bright sunlight (the metadata says 1120AM) The Ranger is firing at 3/4 power to camera left, one B800 is to camera right (max power!) and another one is right behind camera and about 7 feet high, firing into a Softliter II (again at max power, no diffuser panel). The lights are converging to the spot where the leading cyclist is and the cyclists just a few feet behind are mostly illuminated by ambient light. As the Alien Bees had some trouble keeping up with the ambient light I had to push the shutter speed to ....1/500th of second (ISO 100, f9.0, 24 mm) to darken the sky. Coupled with my trusted Canon 7D the Alien Bees wireless triggers worked great and the loss of flashs light in the lower part of the frame is not visible (in the studio, where the flash 'd be the only light source you can sync up to 1/200th before banding becomes annoying). If I'd do it again I would bring the Alien Bees High Output reflector and get another stop of light from the Bees, but we managed. In fact, I am quite happy with the final result, it captures the energy of the day! Plus the backstage reminds me..of Doctor Who for some reason...mmm maybe Judd's green sunglasses?